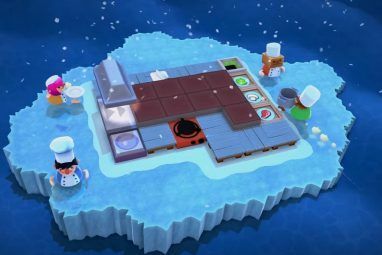 Turn-based mobile games, also known as play-by-mail games, have proved themselves to be hugely popular over the last few years. Millions of players have embraced their tactical sides and spawned huge success stories like Draw Something 10 Cool Websites Featuring Draw Something Art 10 Cool Websites Featuring Draw Something Art Draw Something is a mobile app that started life at OMGPOP but ended up at Zynga after the latter bought the former for $180 million in March 2012. Zynga might have paid over the odds... Read More and Words With Friends 3 Online Tools To Defend Yourself Against Cheaters At Word Games 3 Online Tools To Defend Yourself Against Cheaters At Word Games Don't you just hate it when you're in the middle of a great Words With Friends game and someone manages to luck out with a word like "atropine"? Maybe it's only frustrating when the rest... Read More . 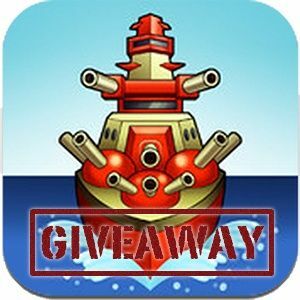 Naval Warfare Multi-Shot is reminiscent of the classic game of Battleships, except with a few twists to the gameplay to make it more palatable for the mobile generation. The game has been developed by a small development team of two people for the iOS platform, which means it’s a truly independent production. If you’ve not played Battleships before – and really, I’ll be surprised if there’s anyone reading this who hasn’t – then allow me to briefly explain the concept. Both players place their ships on a grid-based board before taking pot-shots at one another’s fleet. The locations of the ships are hidden from view but as more and more shots are taken there are less targets to aim at. The player who sinks all of the opposition’s ships is the winner. Simple, fun, board game fun. To make this formula work on the iPhone and iPad, Naval Warfare Multi-Shot introduces a few tweaks to the concept. Taking single pot-shots at one another over mobile devices would take quite some time, and there’s a good chance you or your partner would get very bored before a single game is done. To combat the tedium, each player starts the game with five shots each. Mark your targets, hit fire and cross your fingers. Every time a player loses a ship, the number of available shots is reduced. Before the end of the game you might find yourself taking one or two shots per turn, but with a vastly reduced number of targets this ensures it’s not all over too soon. Because ships can’t overlap or touch each other, each time a ship is sunk the cells surrounding it will be deactivated, meaning you can’t fire at them which also serves to speed up the game somewhat. The game is a universal iPad and iPhone app, and though both versions are identical in terms of features the iPad version naturally provides more space to plan your shots and more information is viewable on-screen at one time. In short, Naval Warfare Multi-Shot is basically Battleships with a brisker pace that translates into a turn-based mobile game quite nicely (provided Battleships is your thing, of course). In fact, this game follows on from a previous title released by the same two developers which stuck rigidly to the one-shot per turn rules. They’ve learned a lot since then, taken feedback on-board and come up with this faster-paced variant instead. Apple’s decision to make proper use of Game Center as an actual matchmaking service like Xbox Live 5 Ways In Which Xbox Live Has Changed Gaming – For Better Or Worse [Opinion] 5 Ways In Which Xbox Live Has Changed Gaming – For Better Or Worse [Opinion] It's difficult to remember a time when games consoles didn't connect to the Internet. I'm now so used to online features being an integral part of the gaming experience, that it's easy to forget that... Read More is taken full advantage of here. In fact you’ll need a Game Center account in order to play. This is a hugely welcome addition and completely removes the need to register yet another account with another developer with another password. All games go through Game Center, meaning that notifications are taken care of and inviting people to play is as easy as picking them from your Game Center friends list. The option to pick a random opponent is also present and worth noting, especially because all matches must be played against human opponents. There is no AI, this is a strictly multiplayer affair – like a proper strategy game should be. Players can have up to 30 active games at once, with multiple games against the same person also possible. There’s a chat feature included for insulting your foes on the right-hand side of the screen and a quick match status can be accessed via the anchor button at the top of the screen. The interface might not be the prettiest on the App Store but it gets the job done, and the ability to scroll through the history of past moves using the buttons at the bottom of the screen is a very nice touch if you blinked and missed the last move. This makes it far more inviting to skip incoming moves if you’re sick of waiting for the animation to complete which you can also turn off from the settings menu. Naval Warfare Multi-Shot is free and supported by adverts, which can be removed with an in-app purchase of $2.99. There are also additional skins that make the game look a lot nicer available for $0.99 each though neither of these purchases are required in order to play. Naval Warfare Multi-Shot is a fun and well-executed free time-waster that will strike a chord with strategy and turn-based multiplayer fans. If you’re the type of person who enjoys a good game of Battleships then you’ll appreciate the modern twists added to this mobile outing. The fact that it’s the work of two dedicated individuals who have improved on their past forays into the App Store is just another feel-good reason to check it out. Explore more about: iPhone Game, Multiplayer Games, Strategy Games. Just curious, I wonder who won this. What if someone belongs to a non-giveaway zone? Will a US address work? It will work, but the prize will be shipped to that address. Once the item arrives at your designated address it is your responsibility to get it to whichever non-giveaway country you reside in! So its a souped up battleship? Absolutely, and unashamedly so. It just does away with the one shot per turn rule in favour of a speedier game. Thanks, free game and chance for a iPad. Game brings me back to my childhood sort of but I was definitely more of a video game kid than board game one. had to borrow (hijack)my daughters iTouch -- but got the app installed - missed the coded code the first time - but then I had a vision - - tried playing a game but it didn't run very well - - all my ships sank!!! Anyway - - Jackson - thanks for another giveaway!!! I find it utterly unbelievable that people are complaining they don't have a chance to win and how not "fair" this is. How are you people grown-ups and still carry this sort of childish mentality? Winning an ipad isn't a right! This is a kind gesture on behalf of the developers! Are you people kidding me?! i cant see the giveaway code. How do you get it I cont find it? Why everyone who doesn't have iDevice is complaining. As someone previously suggested do a google image search and you can very easily find the code within 2 try. Some one in the comment have also provided the answer. Please check it as well. I actually entered the contest and only then noted that my country is excluded from the contest. Too bad for me. I do not ve any apple products .. !! wanna share code with me .. !? Cool, free game and chance for a iPad, thanks. Game brings me back to my childhood sort of but I was definitely more of a video game kid than board game one.You sunk my battleship. Steve Jobs vs. Bill Gates. Apple is a proprietary stricken company - thereby limiting it's customers, while the M$ camp enjoys a multitude of buggy software. Both men are (were) crooks. Entered, yay! Thanks for introducing me to the game (and for the awesome contest)! Sweet Mother of Pearl, people! This really isn't rocket science. 5) Write down the name of the object you see in the middle of the blue splash screen. If you don't own an iPad or an iPhone, borrow one or just read through the other comments--someone has already let the cat out of the bag anyway. And most of all, please cut the guys at MUO a little slack--they're kind enough to give us the opportunity to win some VERY cool stuff as well as give us some VERY good info on a variety of techie toys, so ease up a little and be thankful they're available. I'm from Philippines, am I eligible to join? I have iDevice, and I'm done downloading the app. "For instructions on how to obtain the giveaway code, see Step 1." you have to play the game to get it. Wasn't that clear? It took a couple of tries on the install but it appeared. I rebooted the phone before the last attempt. Not sure but that might have helped. I have an iPhone 4S. Definitely Not a fake giveaway. I got an email response right away. All I can say is keep trying. Nope, I can guarantee it's not fake as can many other users. Try again maybe, or kill the process and then launch again. Pay attention! I sincerely apologize for my comments. It was a mistake on my part. I have been looking for some hidden text in the picture etc . on reading the instructions again it was obvious..
You need to put the code in the newsletter. You also need to set up a way to register for your site without sharing a login and all the contact info etc. Even if I did use Facebook, Twitter or their ilk I wouldn't want to use them to login to another site. Plus it seems a person has to put a post on their wall to get the code. Lotta crap, not worth it. Actually we don't need to do anything. We set up a system for users to login, comment, share and get rewarded for doing so. We've also tried to make it a bit fun, have a whole Rewards section for claiming free software and products (in exchange for points accrued from on-site activity) plus our users don't need to remember ANOTHER login and password. Without sounding rude, if you want to use this side of the site you need to follow the system in place. We're not going to change it. You either think the folks that come here are too stupid to remember a separate login for your site, or you'd rather mine the logins, contacts, etc from other accounts. Using a login direct from one account to another is sloppy security in anyone's book. Of course you're not going to change it. Personally, I hate to create a separate account for each site I'm a member of. I love social logins. And trying to make it easy for people is one reason we are offering social logins on MakeUseOf. We are definitely not mining user data. Right. If one tries to login with a Facebook ID and pays attention, this is the info you're giving away; "Includes your name, profile picture, gender, networks, user ID, list of friends, and any other information you make public." Why does MakeUseOf need a list of someones friends for instance? If you're lazy and want sloppy security then using this type of login is fine for you. Not for me. We need access to the user's list of friends (only user IDs) in order to be able to show the actions completed by his/her friends in the Activity Feed section on the profile page. No one but the user himself can see the contents of the page. I got it and I'm in ..I actually think the game is really good !! Gonna try now to see if I can get my friends on it. Oh Oh and thanks for the cool chance of winning an ipad. All I can say is WOW ! I just won my first game woo hoo !! Everyone stop complaining. The contest is to win an iPad by downloading the game and receiving a code on an Apple i-device. Think it through...all you need is the code to enter the contest. Turn down the hate and chill for a second. Think about it. When I opened the app it appeared for just a second only the first time I opened the app. 2nd, 3rd so on it wasn't there so be mindful of that. Someone has already said what it is in the comments above. Thanks, Kyle. During our tests on an iPhone 5, we found that the splash screen appears every single time. What device did you notice this on? I have an iPhone 4 (32GB - AT&T). I removed the app and reinstalled it with the same result. Hi there,Found the code.I shared on facebook as Carolyn Barnett and tweeted this giveaway as @CarolynRBarnett and shared on google plus as Carolyn Barnett.Thanks for a chance to win. It would be considerate for someone at MUO to respond regarding the barriers to access this process created for followers who don't own the hardware. So in order to win an iPhad product you have to already *have* an iPhad product. No thanks; the best price for an iPhad product is $0 anyway. (now, Android would be entirely different). I D/L'ed the app. Loaded fine. The code hint was prominently displayed on My Apple product. Thanks for the opportunity! Thank goodness someone finally got it right! It's "****". The word is "****". How is that logical !!! It's logical because we're not exactly running a vanilla iPad giveaway. It's sponsored by the game developer. When we do run a regular iPad giveaway (sometime soon), we'll let you know. Yes - I speak English. Maybe MUO does not given that the email subject line and article header list the giveaway as a 64GB iPad, but in the body of the article it downgrades to 32GB. Attention to detail, please!? The giveaway was changed at the last minute to the bigger model which is great for the eventual winner but naturally was an error on our part. The prize will be a 64GB model! Can we enter daily and will it increase our chance of winning? Thx. Can we enter daily until the drawing date? And would it increase our chance of winning? Thx! lol! all these people complaining are so lazy, Just use google to figure it out. No, technically an iPhone or iPod touch will work as well. I would love to win, but I don't have an i-anything at the moment...... :( So, now what do I do???????????? Tim, you need to do two things: 1) RE-EMAIL the code and post it here so we can all enter and 2) honor the 64GB version to the winner, regardless of the developer's original intention. It's not Untapped's fault if they were misrepresented. If they are offering the 64GB version, great - if not, sorry but it's on you. You can make this right, Tim. We all know you can and we're counting on you! No judgement> everyone makes mistakes! Downloading the game is a requirement for participating in the contest. And it's a fair one since the developer of the game is sponsoring the iPad. Plus, obtaining the code is not difficult if done right. The giveaway will be for a 64GB iPad, as Jackson has already pointed out it was initially to be a 32GB model but got swiftly updated to a 32GB model. So swiftly that the copy seemed to have not been updated, we've now rectified this. Untapped were not misrepresented at all. Because the developer is sponsoring this we've taken a different approach. I am sorry you don't agree with it, but the fact remains there are plenty of other competitions to enter and to change the rules would make no sense from the sponsor's point of view. Finally I'd like to say that the game really is great, so I hope when you do finally get an iOS device you check it out! Well Tim and Jackson, I have to admit: after thinking about it further - and then checking my drivers license and passport, I realized something -> it IS a free country! At least the internet is, except its not a country. But if it WAS a country, it would be free too! Except for the parts you have to pay for. I think its a testament to you site that the extreme usefulness and helpfulness of everything you have going on is enough to generate a feeling of entitlement among our members. I admit that I got caught up in it myself. After going over all the original posts with your replies, I thought of two things: 1) like others, I have a tendency to want to post early or not at all and 2) I can easily let my own sense of fairness get clouded by a commonly found, but not necessarily just, desire for equality (the Leninist kind, not the Civil Rights kind) I wonder if you'll get backlash now from cross-talk on other sites (not to mention right here). Take heart and stick with it. The day this site becomes a public utility is the day it becomes "MakeUseless" (sorry, couldn't help that one). You will be able to count on my continued participation. the giveaway code is the name of the item shown on the first screen after launching the game. Ok, I downloaded into my iPhone which is slower. I saw it this time and I can honestly say, ""It did not show on my iPad"". Honestly, it did not show. Guess it loaded too fast. Just so you know. Hey Don did you try killing the process? Double tap home, tap and hold on Multishot then click the X. Try launching the game again and be quick. As far as I'm aware we've had no problems reproducing it on our own hardware. Don't forget to check out our other giveaways too! Can't win an ipad unless you have an ipad. What a waste of time. I downloaded the game, or at least attempted to...on my iPhone and iPad it says waiting. Waiting? Waiting for what???? No idea. Your password, perhaps? It appears for a very short while. If you don't see it, press the home button and launch the game again. Where is the code, i have playing this game.. But nothing shown like you said in step one. Do i need to do inapp purchase to unlock the game? No, you don't. Press the home button and launch the game again. The splash screen is the first thing you should see but it only appears for a split second so if you don't see it, repeat the process. Try entering some of our other giveaways, you can find them at the link below. We will also inevitably be giving away more iOS devices in the future, it's what we do! Well this is too bad... I don't have an iPad or iPhone. But I wish I could win the iPad ;( Not very fair contest. Shouldn't people who DON'T have an iPad get to win iPads and Apple products so they could try it out? Yeah, we're giving those away as well. Thank you, I did. But not the coffee machine ^^; No coffee for me! Thanks a lot though, and thank you for your hard work! Cheers, Claudine! Have fun and stick around for some more interesting giveaways this week. Download the app to get the code? Ain't nobody got time for that! Thanks for participating! You'll receive an email from us shortly.. if I win you mean? coz I'm not receiving any.Also true of the transformer pad. It is unfortunate that I have neither an iPhone nor an iPad to load this software on to get the code in order to win the iPad which I want. Most sweepstakes don't require purchases, and I know the game is free, but I still have to purchase an iPad in order to win an iPad. I would have to say that the "giveaway" is biased towards those that already have an IOS device. I do have a MacBook Pro and it is unfortunate that this game was not also developed for the computer (OSX) as well. I'm afraid downloading the game is a requirement for this contest. It's not bias, it's just a requirement. What's not being honest? We organised the giveaway with the developer who wanted to offer an iPad for downloading his game - this is a nice gesture, and great for iPhone and iPod Touch users or (as some have proven above) search sleuths who found out by other means. I don't mean to sound rude, but there's no entitlement to entry. We have tons of other giveaways for you to enter, but even then you need to exchange points - they're still not open to "everyone". I would enter but I, like other commenters, don't have an iPad or iPhone, so I can't enter to win one. I don't think you all thought this through very carefully. Then just sit this one out. We organise giveaways every week. You're not missing out on much. Borrow someone else's. Problem solved. Yes - I speak English. Maybe MUO does not given that the email subject line and article header list the giveaway as a 64GB iPad, but in the body of the article it downgrades to 32GB. Thanks for the heads-up, Peter! Originally, we planned on giving away a 32GB iPad, but decided to sweeten the deal. Thanks Sean. Got it from your clue. wow downloaded it and loved it! Great idea!! give away the product that would play the game that has the code to win the product that plays the game. Brilliant idea!!! Nope, you could also play the game on an iPhone or iPod touch. Or borrow someone else's device. Don't give up so easily! 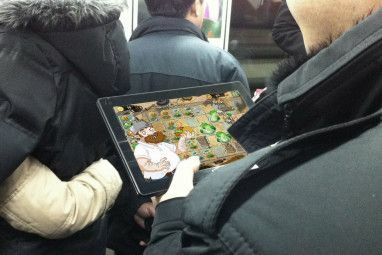 Um, you need an ipad to run the game to win an ipad. Okay, I'll pass this time! Actually, you can also use an iPhone or iPod touch. Doesn't necessarily need to be an iPad, but you would have known about that if you read the review. I don't have an ipad or iphone either! Chill out and let others contend for this iPad. We'll give something else away today and on Monday, and next Thursday. In fact, we have giveaways every week, so you can look forward to that instead. No Giveaway code ever appeared after downloading the game and opening it up.. The splash screen is the very first thing you see after launching the game. If you don't see it, press the Home button and start the game again. It's only visible for a split second. Oh, it's kind of a puzzler! I thought I was having the same problem, but I wasn't. I expected there to be a word, but the code is actually the picture on the splash screen, rather than a word that flashes. Tricky tricky! Can't get the Giveaway Code with an iPad or iPhone!! What about those of us who don't have either? As he said, some of us don't own any Apple products. Agreed, how are we suppose to get the code if we don't own an apple product. It isn't a fair giveaway. It's an entry requirement. If you don't have an iOS device, you'll have to sit this giveaway out, I'm afraid. But don't sweat it. We run giveaways every week. ..assuming you already have an iPad..why still join the contest then..
Why do we even have contests at all then? Should a million dollar lottery have a requirement that you have to be a millionaire to enter? I'm thinking not but then . . . . Sorry to bug you but on my facebook it doesn't show that I liked it, I can see it on google+ and my twitter but not facebook. I got your email already just don't wanna mess up a shot at winning a ipad. 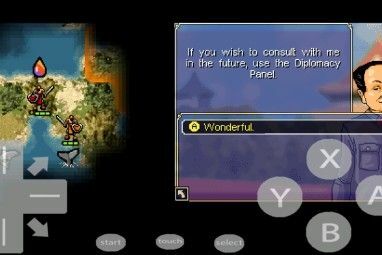 Could you imagine playing this game on an ipad? WOW !